The most comprehensive collection of film writing available. Thomson discusses in critical depth every major film artist from Georges Melies to John Travolta. 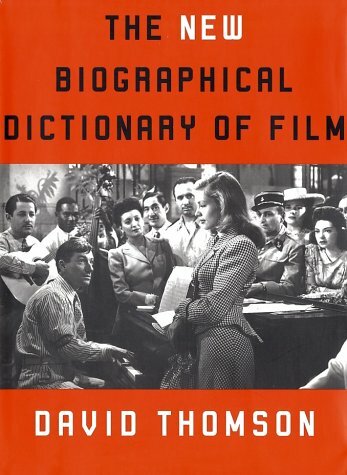 He focuses mostly on directors and actors, but he finds space to discuss certain screenwriters (Ben Hecht), composers (Bernard Herrmann), cinematographers (John Alton and Gregg Toland), producers (David O. Selznick), and other occupations. His writing is always well thought out and clear. He can be aggravating, as he will no doubt dis on someone you love, but when you stumble upon something he loves, it's infectious. A brilliant and invaluable book. Note: In 2002, Mr. Thomson published a revised edition with several new entries, many controversial, all insightful.